Keep your pals up to date with these cool Ben 10 Sticky Notes! 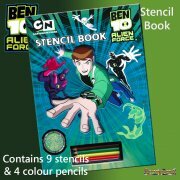 Why settle for boring old yellow sticky notes when you can use the Ben 10 version - 3 individual pads of 20 notes with cool Ben 10 designs. Suitable for ages 2+, each one is approx the size of a standard sticky note you'll find in any office. There are Peppa Pig, SpongeBob SquarePants and Dora the Explorer versions too, all available from our Online Shop.